English, French, German, Italian, Polish and Spanish - ESMERALDA's Results in Brief can now be found in any of these languages, published on the CORDIS website. ESMERALDA's flexible methodology on mapping and assessment of ecosystems and their services contributes to protecting the planet's ecological services. Valuable project outputs guaranteed ESMERALDA a spot in the Result Pack on Biodiversity. According to the article, ESMERALDA created innovative strategies to facilitate European national and regional mapping for the effective assessment of ecosystems and their services. The project contributes to healthy ecosystems, which help mitigate the impacts of climate change, while supporting a green economy, creating job opportunities and enhancing biodiversity. ESMERALDA is one of eleven projects within the Results Pack that prove the need for biodiversity and ecosystem services research to ensure Europe's sustainability, and their relevance for current and future global policy objectives. Find the project's Results in Brief here and the full Results Pack here. The concept of quantifying these so-called ecosystem services, which has grown in recent years, has proved controversial for some environmentalists who oppose reducing nature to numbers. Others see it as a way to get businesses and policymakers to account for nature to make better decisions that preserve biodiversity. First, though, working out what ecosystem services we have, and how much of them, requires mapping where they are. To aid this process, a project called ESMERALDA tested tools and methods to help decision-makers map and assess ecosystem services across Europe. The end result is an open access online tool that provides full guidance for mapping and assessing ecosystem services. ‘The key message is to show the human dependence on functioning nature. Everything that we get and receive is related to ecosystems and their functions, and biodiversity,’ said Professor Benjamin Burkhard, a geographer at Leibniz University in Hannover, Germany, and project coordinator of ESMERALDA. ‘If we can really show how much a tree, for example, provides us with fresh air or how much carbon it’s sequestering, I think we will have more appreciation of nature’s contribution in society and decision-making,’ he said. ESMERALDA’s approach takes into account three areas – biophysical, which refers to physical factors such as land use or volume of greenhouse gases – sociocultural and economic. In its country case studies, ESMERALDA assessed different ways of valuing the three areas. For example, a study on Germany’s Bornhöved Lakes District combined biophysical data such as crop volumes and numbers of pollinators with sociocultural information including a survey of people on the aesthetic values of landscapes. Prof. Burkhard says that a wide-ranging assessment is important to obtain a full picture. ‘It doesn’t help you to only have an economic value, but it also doesn’t help you to only have a social value. You need to have the whole set of biophysical, social and economic values for a perfect assessment,’ he said. On the thorny issue of attaching economic values to nature, he says this approach can help raise awareness among policymakers and businesses. Prof. Burkhard says that awareness among EU decision makers about ecosystem services has grown over the course of the three-and-a-half-year project, which ended last July. The next stage for upcoming projects will be to start applying the ESMERALDA methodology in real-life situations, such as policymaking at a national level on issues such as agriculture, or local spatial planning. For Guy Duke at the Institute of Chartered Accountants in England and Wales (ICAEW) valuing the world’s natural capital – its stock of natural assets – could help businesses make more environmentally sustainable decisions. However, he says that we are only at the ‘tip of the iceberg’ in terms of the number of companies that have started to understand and address this. ‘There’s a very long way to go,’ he said. Duke leads the We Value Nature campaign which seeks to encourage businesses to embed the value of nature into their decision-making and apply the Natural Capital Protocol. This is a global set of standards that allows businesses to identify, measure and value what role natural capital plays in their business. The project is run by ICAEW, and other organisations that are part of the international collaboration, the Natural Capital Coalition. Since launching last November, the project has started reviewing barriers and bottlenecks that impede businesses from investing in natural capital, with training to be later developed for companies. Duke says one aim is to identify industry sectors in which action will bring the most benefit to nature, followed by specific businesses in those sectors and then individuals with the most influence on shaping decisions that affect natural capital and biodiversity. Spencer says some companies have recognised, for example, that restoring wetlands acts as an effective flood defence, thus saving money. Spencer stresses that the project is not about attaching a single price that commoditises nature but about ascribing a value through a mix of descriptive information and numbers to build a complete story. ‘We never, ever put a price on nature,’ he said. Natural capital is, however, far from an easy bedfellow of biodiversity and the term has provoked fierce debate among environmental activists such as the British campaigner George Monbiot who argue that the concept is not only wrong, but counterproductive. Dr Berta Martín-López, a professor for sustainability science at the Leuphana University of Lüneburg, Germany, who worked on an earlier ecosystem services project called OpenNESS, warns future biodiversity programmes against putting too much stock in monetary value as a whole. ‘To me, the homogenisation of world views to only one simplistic view that fits with the mindset of monetary values and capitalism is the most dangerous pressure for biodiversity,’ she said. Dr Martín-López highlighted that nature goes far beyond just providing basic services – it also offers intangible, non-material benefits that cannot be valued in monetary terms. ‘The multiple ways by which people develop relationships with nature contribute to the construction of our cultural identity, sense of place and belonging,’ she said. The approaches that will pave the way for the future, she says, are those that ‘foster a diversity of world views’. This post The business of biodiversity: can we put a value on nature? was originally published on Horizon: the EU Research & Innovation magazine | European Commission. The recently introduced online resource - the ESMERALDA MAES Explorer - aids decision-makers from policy, science and society to implement Mapping and Assessment of Ecosystems and their Services (MAES) at different levels. MAES can reach from national policy to local spatial planning or businesses, who want to support sustainable resource use and understand the condition of ecosystems, their ability to provide services and the socio-cultural and economic values related to them. The online guidance tool is created by the collaborative EU Horizon 2020 funded Coordination and Support Action "ESMERALDA - Enhancing ecosystem services mapping for policy and decision making" to showcase major project results and to make them available Open Access, in support of Action 5 of the EU Biodiversity Strategy to 2020. Together with the EU MAES Working Group MAES, ESMERALDA developed the platform to share the project's broad experience and to direct EU Member states, and other countries alike, through the process of mapping and assessment of ecosystems and their services. Starting from various questions arising from policy, business or society, through supporting stakeholder identification and related network creation, the ESMERALDA MAES Explorer provides ESMERALDA-derived practical guidance to mapping and assessment of ecosystems and their services, all the way to dissemination of respective outcomes and their implementation in policy and decision making. Figure 1: The homepage of the ESMERALDA MAES Explorer guides you through the seven key steps of mapping and assessment of ecosystem services. The MAES Explorer also links to the ESMERALDA MAES Methods Explorer - an interface that allows users to explore the comprehensive methods database created within ESMERALDA. The purpose of this database it to collect the majority of available methods to map and assess ecosystem services. Its aim is also to link those methods to specific ecosystem types, ecosystem services, questions from policy, business and society, tiers and practical case studies. "To ensure the perennity of the excellent project results available in the ESMERALDA MAES Explorer, we decided to cooperate with large information hubs and integrate crucial findings to external platforms, so they will be online after the actual project will have ended," says project Coordinator Prof. Benjamin Burkhard, Leibniz Universität Hannover, Germany. Based on regular stakeholder meetings, the consortium decided to integrate the online guidance tool to the Ecosystem Services Partnership (ESP) platform. With more than 20 000 visitors in the past year, an audience of over 3000 newsletter subscribers, and a total of 6000+ followers on its social media channels, ESP has proven itself to be a suitable host for the ESMERALDA MAES Explorer. The common future strategy will sustain and expand the ESMERALDA stakeholder network after the project lifetime with the ultimate goal to support EU Member States and local practitioners in achieving and delivering their part towards Action 5 Target 2 of the EU Biodiversity Strategy. To access the ESMERALDA MAES Explorer, click here. The Bulgarian Academy of Sciences (BAS) hosted a one-day workshop on possibilities for implementation of ESMERALDA results in Bulgaria. Project partners and stakeholders discussed how to continue with mapping and assessment of ecosystems and their services on a national level after an ambitious and dedicated participation in the project. The event took place on 3rd July 2018 in the National Institute of Geophysics, Geodesy and Geography in Sofia, Bulgaria. A review of the different methods for mapping and assessment developed within ESMERALDA, was followed by a discussion on the best approaches for creating a strong stakeholder network and for sustaining the foundation for mapping and assessment of ecosystems and their services in the country. "ESMERALDA, being a coordination and support action of the EU, focuses on the use of knowledge and dissemination of science. For that reason, the practical implementation of results is crucial," explained project partner Stoyan Nedkov, Assoc. Professor in the National Institute of Geophysics, Geodesy and Geography. The workshop ended with a demonstration of the ESMERALDA MAES Explorer, a platform designed to share ESMERALDA’s broad experience throughout the project and to direct EU Member states and other countries alike through the process of mapping and assessment of ecosystems and their services. ESMERALDA gathered scientists, practitioners and policy-makers for its final project Conference, to demonstrate key scientific results and practical resources designed to assist and guide EU Member States in Mapping and Assessment of Ecosystems and their Services (MAES) in their respective local, national and pan-national contexts. The three-day Conference took place from 11 to 13 June 2018 in Brussels, Belgium. The event focused on how the ESMERALDA flexible mapping and assessment methodology supports decision makers from policy, business and society to integrate ecosystem services in their day-to-day work. About 100 delegates from 27 EU Member states, 6 other European countries, EU outermost regions, and various European Commission's bodies and institutions attended the event. The first day of the Conference was dedicated to meeting members of the EU MAES working group and discussing various tools, their interoperability and integration of results on similar platforms. Within the Fun Fair on tools and methods to map and assess ecosystems and their services, participants had the chance to click through the MAES Explorer - an online platform assisting non-scientific users of ESMERALDA's methodology in choosing the right approach and execution in their specific context. On day two of the project meeting, the Director-General of DG Environment and Deputy Director-General of DG Research & Innovation highlighted how the ESMERALDA outcomes are supporting the implementation of various EU policies. Other EC members and stakeholders explained the integration of the concept of ecosystem services in EU member states. On day three, ESMERALDA showcased its flexible methodology and highlighted results and conclusions across the project's case studies. The project presented its open access book "Mapping Ecosystem Services" and its Special Issue, publicly accessible in the open access journal One Ecosystem, where interested parties can acquaint themselves with a variety of results and methods. The Conference ended with a joint discussion with the whole team on next steps towards sustaining the ESMERALDA network, as well as making best use of the project’s valuable findings. We are putting an end to the #ESMERALDAfinal Conference with a couple of fun facts about the project and good ideas on how to continue networking and make best use of ESMERALDA in the future! All presentations from the final project Conference can be found on the website's media center. In June 2018, ESMERALDA joined the 5th European Congress of Conservation Biology (ECCB 2018) held in Jyväskylä, Finland, to demonstrate its key deliverables and progress towards providing a flexible methodology for the assessment of ecosystems and their services on both regional and European level. Themed Planetary wellbeing, the fifth installment of the congress gathered hundreds of conservation biologists and ecologists from around the globe. With a strong presence were the early researchers eager to leave their own novel scientific mark in the improvement of Earth’s health. Reaching out to young experts with ESMERALDA’s findings and know-how could be crucial in resolving knowledge into future-proof and environmentally friendly strategies and practices. Interested in Mapping & Assessment of #Ecosystems & their services? The latest ESMERALDA Workshop took place from 19 to 22 March 2018 in Eger, Hungary and focused on testing the final version of the flexible ecosystem services (ES) mapping and assessment methodology in policy- and decision-making through real-world case studies. Involving a larger variety of policy- and decision-making processes and actors, including businesses and citizens, coming from a range of geographical contexts, the Workshop was divided into ten sessions. On day one, the participants coming from 22 EU member states, Israel and Norway, had the opportunity to receive an update on the final version of the ESMERALDA flexible methodology, including the concept, structure and contents of the "Final Guidance Documentation". The session was followed by a keynote speech on "Perspective on using ES mapping and assessment in the private sector", based on the experiences of the Land Degradation Neutrality Fund under the UNCCD in session two. In sessions three to six, the meeting focused on three case studies from Hungary, Finland, and Sweden, which served as a basis to analyse how mapping and assessment of ES supports different phases of decision-making processes. The last session of day one was a panel discussion involving stakeholders in an overall review of the ESMERALDA methodology and products. Day two was dedicated to a field excursion to the Bükk National Park, which is a protected area since 1976, to safeguard the rich fauna and flora, as well as to protect geological and cultural heritage and various ecosystem services of the area. Finally, day three and the last three sessions within the Workshop concentrated on finalising the different ESMERALDA products and Deliverables. Participants actively discussed further actions after the completion of the project, such as maintaining the stakeholder network and products in the future. Within a three-day Workshop, ESMERALDA project partners and stakeholders tested the final version of the flexible ecosystem services mapping and assessment methodology in policy- and decision-making in real-world case studies and analysed how "Mapping and Assessment of Ecosystems and their Services" (MAES) can support different phases of a practical decision-making process. The Workshop took place from 22 to 25 January 2018 at the University of Trento, Italy and focused on urban planning as an illustrative and relevant decision-making process. ESMERALDA case studies from the cities of Trento (Italy) and Antwerp (Belgium) were used to practice the whole MAES process. On day one, participants explored the spectrum of needs and requirements - from the more strategic to the more technical stages - that determine the effectiveness of MAES in informing and supporting policy, as well as decision-making processes. During the second day of the Workshop, participants coordinated the activities of the Consortium Partners towards achieving and showcasing the final ESMERALDA Deliverables through a plenary discussion focusing on structuring and implementing the ESMERALDA "Final Guidance" online document and tool. The third Workshop day was dedicated to a field excursion to the ‘Arte Sella: the contemporary mountain’, which displays an art exhibition, accumulated from a desire to continue a dialogue between nature and the natural world. The main outcome of the seventh ESMERALDA Workshop was that case study stakeholders as well as ESMERALDA partners were introduced to the ESMERALDA general approach, which has been further developed within the ESMERALDA consortium. This was particularly useful for identifying the main outcomes and remaining tasks, such as further method testing in case studies, networking, developing documentation for MAES in EU member states and developing long-term strategies for the ESMERALDA products. Fifth MAES report on urban ecosystem condition is out. The fifth MAES report presents indicators for mapping and assessment of ecosystem condition at European level. A set with specific indicators is available for assessment of ecosystem condition per ecosystem type. A core set with key indicators is available to support an integrated ecosystem assessment across ecosystem type. Photo: ESMERALDA members at the 9th ESP Conference in Shenzhen, China (Photo: Kremena Burkhard). The 9th Ecosystem Services Partnership (ESP) World Conference took place in Shenzhen, China, from December 11-15, 2017. This year’s conference was under the theme "Ecosystem Services for Eco-civilization: Restoring connections between people and landscapes through nature-based solutions". ESMERALDA was well-represented among the about 400 delegates from 49 countries. Altogether 12 project collaborators from 8 partner institutions and 2 advisory board members were active organizing the conference, hosting thematic sessions and giving presentations. Photo: Group picture from the 9th ESP Conference in Shenzhen, China (Photo: Ida Kubiszewski). Italian scientists have published an approach for mapping ecosystems at national scale. The publication is available here. You can contact Giulia Capotorti for more information. The project meets key stakeholders for its Mid-term Conference in Plovdiv, Bulgaria. For nearly two and a half years to date, the Horizon2020-funded EU project ESMERALDA has been working hard towards the development of a flexible methodology in support of pan-European and regional Mapping and Assessment of Ecosystem Services (MAES). From 2 to 5 October, in Plovdiv, Bulgaria, the ESMERALDA project met with key stakeholders from the EU member states, the European Commission and Science-Policy-Society Advisory Board members to present a final version of its ecosystem services mapping and assessment methodology, and collect feedback and ideas for improvements and implementation. Altogether 70 participants attended the meeting. Ways in which ESMERALDA can support EU member states during the final year and beyond the project and ideas how the national support groups could activate themselves and build national actor networks that carry on the support actions and provide discussion for the long-run. Useful methods and tools for mapping and assessment of ecosystems and their services. Possible structure and content of guideline documents and tools to support the applications of ecosystem services mapping and assessment methods by policy, decision-makers from business and practice as well as science and the society. Indicators to measure progress on phase 1 and phase 2 of Action 5 of the EU Biodiversity Strategy’s Target 2. Coming back from this meeting, the participants from the 37 ESMERALDA partner organisations from across 31 different European countries were using the feedback to create a roadmap for integration of the recommendations for the last project phases and towards implementation in practise of policy and decision making. During the field trip to the Balkan National Park on the second day of the meeting, the participants had the chance to familiarize themselves with the progress and objectives of the EnRoute project (Enhancing Resilience Of Urban Ecosystems through Green Infrastructure) by visiting key stakeholders in Karlovo, the Bulgarian City Lab for the project. Two new positions open at the Helmholtz Centre for Environmental Research (UFZ) as a part of the large European-funded H2020 project ECOPOTENTIAL. The project is looking for one PhD student and one Postdoctoral researches to conduct ecosystem service research using earth observation data within the international project "ECOPOTENTIAL" with focus on habitats in European national parks. ECOPOTENTIAL focuses its activities on a targeted set of internationally recognised Protected Areas, blending Earth Observations from remote sensing and field measurements, data analysis and modelling of current and future ecosystem conditions and services. ECOPOTENTIAL considers cross-scale geosphere-biosphere interactions at regional to continental scales, addressing long-term and large-scale environmental and ecological challenges. ESMERALDA project partners and stakeholders met for a 3-days Workshop to discuss latest developments in the project, to test ecosystem services mapping and assessment methods across European biomes and regions and to plan future actions. The event took place from 4 to 7 April 2017, kindly hosted by the Autonomous University of Madrid, Spain. During the first day, ESMERALDA partners had the opportunity to present latest project results. Special focus was placed on presenting the progress in developing ESMERALDA’s Flexible Methodology for Mapping and Assessment of Ecosystem Services (MAES). Another hot topic was the development of a Europe-wide database to track the progress of MAES methods development and implementation across member states. The second Workshop day was used for a field visit of the Guadarrama National Park and its mountain range, containing some ecologically very valuable areas providing numerous ecosystem services. Case studies on different spatial scales and varying biomes from Spain, Bulgaria and the Azores and the methods tested within them were presented and discussed with Workshop participants on the third day, where also a dedicated session on marine ecosystem services mapping was organised. During a special stakeholder panel discussion organised during the last day, practitioners and policy makers had the opportunity to give their direct feedback about the presented results of ESMERALDA. Next steps for ESMERALDA will involve not only further developing the project’s Flexible Methodology for mapping and assessment of ecosystem services, underlying databases and test cases, but also working on integrating all results towards a widely applicable resource for mapping and assessment of ecosystem services and related policy and decision making in Europe. The new book Mapping Ecosystem Services provides a comprehensive collection of theories, methods and practical applications of ecosystem services (ES) mapping, for the first time bringing together valuable knowledge and techniques from leading international experts in the field. Published by Pensoft, the book is both available in an online open access version via the publisher's Advanced Books platform, and can be ordered in paperback and hardback format. Human well-being and economic prosperity are largely dependent on ecosystem conditions and the essential goods and services they provide to mankind, such as fertile soils, multi-functional forests, land and seas, fresh water, clean air, pollination, and climate regulation, to name just a few. Mapping ecosystems and their services is a powerful tool to raise awareness about such areas of ecosystem goods and services supply and demand and to assist environmental education about human dependence on functioning nature. ES have the potential to become a major tool for policy and decision making on global, national, regional and local scales, with a myriad of possible applications. Sustainable management of natural resources, land use optimisation, environmental protection, nature conservation and restoration, landscape planning, nature-based solutions, climate protection, disaster risk reduction to environmental education and research are just some of the areas where the concept can be applied. 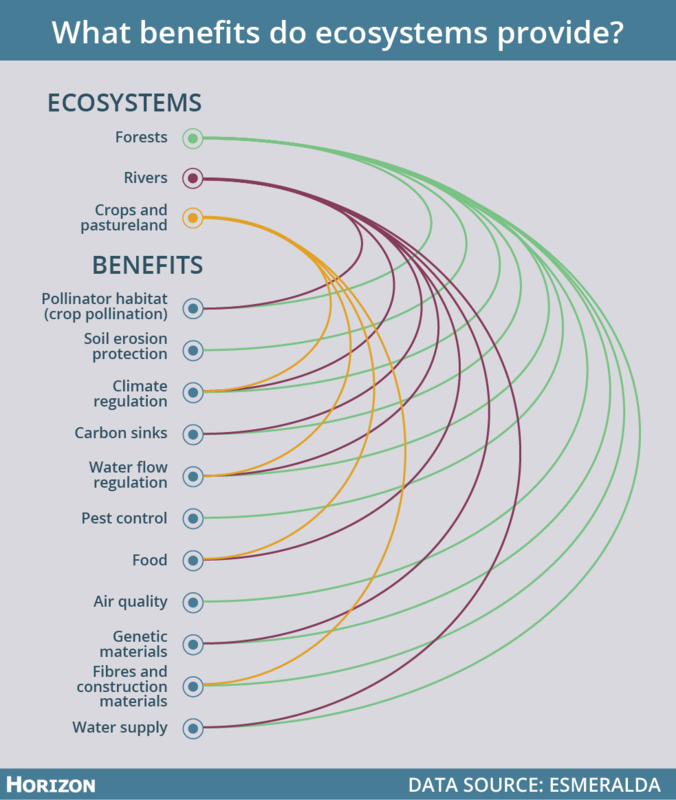 In this context, mapping ecosystem services constitutes a very powerful tool to bring ES into practical application. Being able to efficiently communicate complex spatial information, ES maps are very useful for raising awareness about areas of ecosystem services supply and demand. Furthermore, maps are mandatory instruments for landscape planning, environmental resource management and land use optimisation. Targeting an audience broader than just the research community, the new Mapping Ecosystem Services book provides in eight chapters insights in ES and mapping theory, ES quantification and mapping methods and tools and related uncertainties, in combination with examples of application in practice. "Our aim was to present concise chapters in a professional but understandable language in order to facilitate their readability and comprehension. For example footnotes with direct links and suggestions for further reading are provided at the end of each chapter", explain the editors Prof. Benjamin Burkhard, Leibniz Universität Hannover and Joachim Maes, Joint Research Centre, European Commission. "We hope this book is helpful and supports the appropriate mapping of ES!". "There are still big challenges ahead of us such as the improvement of the mapping and assessment of the ecosystem condition and the integration of the assessment of the ecosystem condition with ecosystem services and the construction of the first ecosystem accounts. As highlighted in this book, we are however on a very positive track! ", comments Anne Teller, European Commission, Directorate-General Environment in her preface to the book. The Advanced Books platform is launched by Pensoft to publish new books or re-publish such previously available in paper or PDF only, in an advanced and semantically enhanced HTML and XML formats, to accelerate open access, data publication, mining, sharing and reuse. Advanced Books builds on the novel approaches developed by Pensoft's journals. Being at the core of the EU’s Biodiversity (BD) Strategy, Mapping and Assessment of Ecosystems and their Services (MAES) across EU countries is an important stepping stone towards the achievement of a sustainable future for Europe. While ESMERALDA has already achieved substantial progress towards analysing and supporting the process of implementing MAES across EU member states and to deliver a flexible methodology for pan-European and regional assessments, little has been said so far about Europe’s Outermost Regions (ORs) and Overseas Countries and Territories (OCTs) in this context. The ORs and OCTs with their very specific social-ecological system settings are hotspots of biodiversity and need special consideration in management. Initiated and organised as a joint activity of ESMERALDA, the European Commission DG Environment’s Voluntary Scheme for Biodiversity and Ecosystem Services in Territories of European Overseas (BEST) and the University of Azores, a dedicated workshop on MAES in EU’s ORs and OCTs took place from 28 Feb to 03 Mar 2017 in Ponta Delgada, São Miguel Island, Azores, to start the process of exchanging knowledge and initiate coordinated MAES activities in these special regions and adjacent marine areas. Group photo of workshop participants taking during the field trip to Lagoa das Sete Cidades, São Miguel Island, Azores, Portugal. During the 3 day workshop, the 26 participants, including representatives of Europe’s ORs&OCTs, including the Azores, French Guiana, Canary Islands, Martinique, Bonaire and Reunion, presented their work on assessing biodiversity, ecosystems and their services. The BEST initiative also outlined its ongoing projects in the OR&OCTs, as well as plans for future developments. Partners from ESMERALDA presented the project’s implementation strategy, results and progress towards creating a flexible MAES methodology. The project also hosted practical workshops on application of the ESTIMAP model on recreation and pollination ecosystem services, application of the RIOS model for watershed management for ecosystem services, a participatory GIS session and a session dedicated to marine ecosystems. Selection of images from the workshop’s plenary sessions and practical trainings. This workshop was only a first step towards exchanging knowledge, creating mutual understanding and establishing respective supporting and coordination scheme for MAES implementation in EU’s ORs&OCTs and marine areas. Further workshops, staff and student exchanges and common case studies were planned during the event on the Azores. If you have not checked our Insider Rubric in the last few months, then you have missed on three new additions, providing a great insight on the project's diverse team, bringing expertise form various fields and backgrounds. The last three addiotions to the rubric - Davide Geneletti, Pavel Stoev and Fernando S. Martín - share their research interest form fields varying from speleology and supporting decision-making to communication and social impacts ecosystem services approaches. Davide Geneletti is an Associate Professor of Spatial Planning at the University of Trento, where he teaches Environmental Impact Assessment and Environmental Planning. Davide is also leader of the research group PLANES-Planning for ecosystem services. Being an Executive Board Member and Work Package Leader, within ESMERALDA he mainly works in the area of decision support, i.e., looking at ways to mainstream ecosystem services into real-life decision-making processes. Pavel Stoev is an Editorial Director at Pensoft Publishers, while also holding the position of a Professor of Zoology at the National Museum of Natural History in Sofia, Bulgaria. Being an Executive Board Member within ESMERALDA, he also acts as a leader of Work Package 6, dealing with the project’s dissemination and outreach. Fernando Santos Martín is a Senior Researcher working at the Social-Ecological Systems Laboratory at the Autonomous University of Madrid. During the last seven years he has been involved in several national and international cross-disciplinary research projects and teaching activities. Sofia, Bulgaria was the host of the two-day Conference "Mapping and assessment of ecosystem services - Science in action", organized by the EEA-funded project "Methodological Support for Ecosystem Services Mapping and Biophysical Valuation" (MetEcoSMap). The event, which took place on 6 and 7 February, brought together 133 experts from 21 countries. The conference focused on mapping and assessment of ecosystems and their services across the different countries represented at the event. MetEcoSMap presented their work on the development of a methodological framework and application results for mapping and assessment of ecosystem services in Bulgaria. ESMERALDA was represented at the event by several consortium partners, among them Benjamin Burkhard, who spoke on "Integrated mapping and assessment of ecosystems and their services", as well as Joachim Maes and Fernando Santos, who presented their research in keynote speeches. The Bulgarian ESMERALDA partners Svetla Bratanova-Doncheva and Stoyan Nedkov were two of the key organisers of the whole event. Mapping and assessment of ecosystems and their services (MAES) are core to the EU Biodiversity (BD) Strategy, where Action 5 sets the requirement for an EU-wide knowledge base. During the conference, progress towards achieving these objectives with special focus on Bulgaria was presented and scientists had the opportunity to exchange know how and measure progress against other countries. The Institute of Physical Geography and Landscape Ecology at Leibniz Universität Hannover is seeking a highly motivated scientist for research and development work in the transdisciplinary field of ecosystem services, ecosystem conditions and functions. Special focus is on the interrelations between ecosystem conditions and related ecosystem service supply. The work is integrated in ongoing international (ESMERALDA, MAES Working of the EU, ESP) and national (cooperations e.g. with the BfN, UBA, ESP-DE). The job holder shall furthermore contribute to teaching in the BSc and MSc curricula within the integrative education in Physical Geography and Landscape Ecology. The possibility to derive a PhD thesis within above-mentioned research fields is given. Required are a degree (MSc, Diploma) in related disciplines (e.g. geography, landscape ecology, environmental sciences, landscape or environmental planning, geoinformatics, biology, hydrology or agricultural sciences) and solid English language skills. Additionally we expect methodological knowledge (e.g. GIS, data analysis, modelling, statistics) and experience in interdisciplinary project work. More information, available in the OFFICIAL JOB OFFER! A new online course Ecosystem Services: a Method for Sustainable Development is now available immediately on the Coursera MOOC platform. Produced by the University of Geneva, the Geneva Water Hub, the Luc Hoffmann Institute and the Natural Capital Project, the course aims at anybody interested in mastering the strengths and weaknesses of the Ecosystem Services concept as a tool for promoting sustainable development. Subjects covered will be both technical (methods for valuation, data acquisition, etc.) and socio-political (how to mainstream the process, criticism of the method, etc.). An introductory video (3min) gives a feel for the course content and philosophy. Learners will hear from many of the field’s leading minds. The course is taught by three primary instructors and by 29 guest instructors and interviewees coming from many of the key institutions (the Natural Capital Project, WWF, IUCN, IPBES, TEEB, Luc Hoffmann Institute) and Universities. Learners can expect to hear multiple contrasting opinions. The full syllabus and list of instructors on the course page. The course is offered "on-demand". In practice, class cohorts are formed on a regular basis and you can take as much time as necessary to complete the course (2-5 hours for 5 weeks is a rough estimate). The first cohort begins February 2nd 2017. Access to all course materials is free. To obtain a certificate of completion costs 49 USD. Financial aid is available (see FAQs on bottom of the course page).